Atlanta's skyline is about to get a signature addition, but not in the Georgia capital's downtown, midtown or even Buckhead neighborhoods. thyssenkrupp Elevator announced plans in July to build a new headquarters and 420-foot (128-meter-) tall elevator qualification and test tower in Cobb County near The Battery Atlanta and SunTrust Park, where the Atlanta Braves now play home games. The test tower will be the tallest of its kind in the U.S. and one of the tallest in the world. With 18 shafts, the Innovation Complex test tower can be used to trial new concepts and product pilots, including high-speed elevators, the two-cabins-per-shaft elevator system, TWIN, as well as the world's first rope-less and sideways-moving elevator system, MULTI. In addition, the test tower will also conduct tests to ensure compliance with stringent safety requirements on standard elevators. The location of the complex, which will be built in conjunction with the Braves Development Company, is one of the busiest in the Atlanta metro with Interstates 75 and 285 intersecting and substantial new capital investment nearby, including Mercedes-Benz's recently opened North American headquarters. The thyssenkrupp Elevator Americas Complex will house more than 900 full-time employees, or approximately 6 percent of thyssenkrupp Elevator Americas' total workforce across North America. Completion is scheduled for 2022. "Atlanta is synonymous with mobility and innovation, and this move gives us one complex in a national hotbed of innovation that will allow us to serve our customers better than anyone in the industry, while providing a high quality of life for our employees," said Rich Hussey, CEO of thyssenkrupp Elevator Americas. Added thyssenkrupp Elevator CEO, Andreas Schierenbeck: "Our new test tower in Atlanta will be a testimony to thyssenkrupp's commitment to investing in its global network of innovation centers, which all have forged ever-deepening ties with students and universities nearby," he said. "Within our network of spectacular high-speed test towers in Germany and China, the new facility in Atlanta will be the third laboratory for futuristic technologies such as the world›s first rope-less elevator, MULTI, and the proven high capacity, two cabins per shaft elevator, TWIN. Not everyone gets to work on such a project in their corporate real estate career. One project participant, Chris Watts, managing director at JLL in Chicago, refers to it as "one of the most exciting" he's worked on so far. "Having spent a lot of time on manufacturing location selection with heavy job counts in mainly rural geographies, this one's in a sub-market of Atlanta," he notes. "But the site selection process began by looking at rural locations, partly because the client's existing facility in the state is rural, as are other facilities they have around the world." 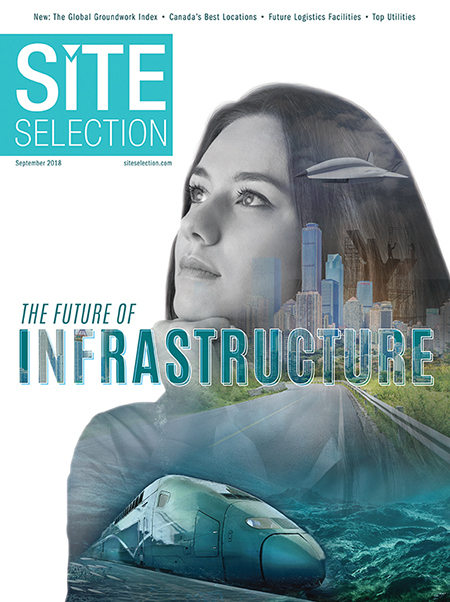 Eight states from the East and South to the Midwest were in the running initially, and site costs, engineering talent and airport access were among the key location drivers, Watts relates. At one point in the process, a non-rural, more accessible site framework was suggested and agreed to, and the scope went from being primarily an R&D project to the complex now planned. The in-town option makes even more sense in the context of employees and access for those visiting the center, particularly city inspection and regulatory agency personnel involved in elevator certification. A similar project in rural Germany is turning into a destination, says Watts, and that will be true even more so near The Battery development on the north side of Atlanta. "At every other site we looked at, the idea was to imagine what our development would do to bring the location along. But this opportunity was more about what already exists and how complementary what we are doing would be there. There is a magnetic feeling to The Battery," he notes. "There are people there all the time. Even though it's new, there is a core to it, and community building going on around it. My sense is that that area was starved for a center where people could gather, and The Battery is it. That's why we chose to go there — it's a location people already want to be."